The Zookeeper’s Wife tells the true life story of a Polish couple, during WW2, who use the remnants of the zoo they run in Warsaw, Poland to shelter Polish Jews. They hide them in the basement of their home, obtain new identities for them and transport them out of the country to escape life in the Warsaw ghetto.Award winning director Niki Caro guides Jessica Chastain, as Antonina Zabinski and Johan Heldenbergh, as Dr. Jan Zabinski, who own and manage the Warsaw Zoo. 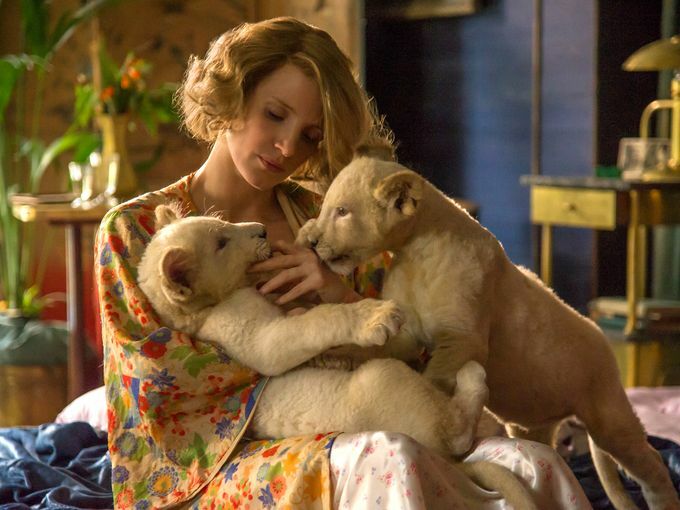 Adapted from the book, The Zookeeper’s Wife: A War Story by Diane Ackerman, the film is a decidedly feminine story that centers around Antonina, the animal lover, and the extension of her humanity. The chance to shelter and hide Jews sort of befalls the family by chance as they seek to save friends, as the Nazi’s are clearing the Jews out of the city and into the ghetto area. Future rescues involves hiding and shuttling people out of the ghetto under the watchful eye of armed guards, which they accomplish by turning the bombed out zoo into a pig farm to feed the soldiers, thus remaining in some semblance of operation. Jan and friends hide refuges under garbage that they cart out of the ghetto daily to feed the pigs and hide them in their basement in cage and tunnels areas formerly used for the zoo animals. While this is a story of heroes, and a solid one at that, it is a bit unusual in that these heroes did not set out to be heroic or have goals to be. This story is more of the character of what a good person is and what a good person does when given the opportunity to be helpful and kind; to do the right thing under the circumstances. It is clearly a woman’s story, which may explain why it took so long to get to print and to the screen, for Antonina is clearly the earth mother and driving force behind the rescue effort. Antonina turns her kind animal loving heart towards humankind, and is willing to risk her life and that of her family in order to save however many people she can in her ‘human zoo”. The parallels between the zoo and the refugees in hiding are unmistakable. She is even willing, if necessary, to sacrifice herself- feigning the attentions of a Nazi researcher and former associate, Lutz Heck, played by Daniel Bruehl, who grows more menacing as the story advances with the war. There are going to be obvious comparisons between Chastain and Sophie’s Choice with her enchanting accent, the Zabinskis and Oskar Schindler. The film unfolds and feels somewhat like a play, with performances that could be found on an overly dramatic theater stage. There is some animal violence, for the sensitive of heart and it is pretty clear which creatures are real and which are not and that is somewhat distracting. Full of clichés, and lacking in substance or anything really new to add to the holocaust odyssey, it is lacking in original dramatic moments, yet Zookeeper’s Wife will be popular with the viewers who love an optimistic story where ordinary people can rise to be great. It lacks the dept and inspiration of another Schindler’s List, feels a little piece mealed but will join the ever expanding list of Holocaust films. Around 300 were saved and only two were lost before the end of the war, so the effort was significant to be sure. It was an audience pleaser during a recent screening for Dallas Jewish Film and received a warm round of applause at its conclusion. The story has a nice ending and an interesting post film era ending. It is suitable for PG 13 audiences.